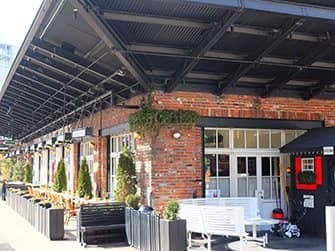 The Meatpacking District is a district in Manhattan, New York, which runs roughly from West 14th Street to Gansevoort Street and the Hudson River to Hudson Street. In recent years (partly due to construction of the High Line Park) the area is extended North to West 16th Street and East of the Hudson Street. In 1900, the Meatpacking District was the home of 250 slaughterhouses and packing plants, giving the district its name. Meanwhile, there are only thirty left in the district. The neighbourhood is now known especially for its vibrant, glamorous nightlife. You can read all about this here. 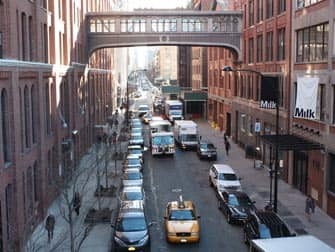 Before Meatpacking District was chosen as New York’s ‘most fashionable district’ in 2004, everything was a lot less glamorous. In the 60s the decline set in, reaching an all time low in the 80s. 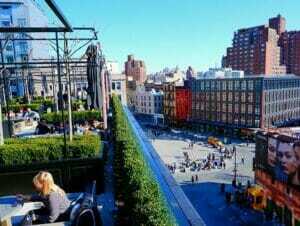 The Meatpacking district was a raw, industrial area at the time, the epicentre of drug trafficking and prostitution. Just a few years later in the late 90s, things were looking bright again. This transformation started when trendy boutiques and nightlife came to the area, setting the tone for the neighbourhoods new character. 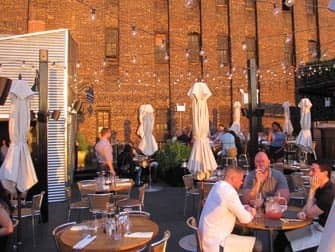 Almost two decades later, they’re still the main pillars of Meatpacking District as we know it today: nightlife and fashion. 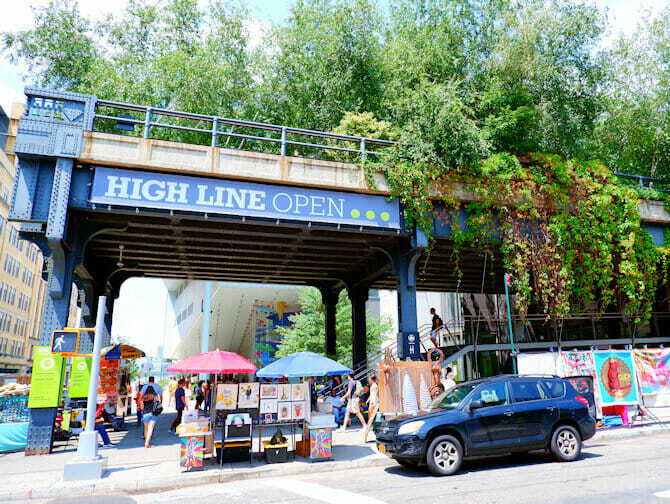 A special highlight of Meatpacking District is High Line Park. 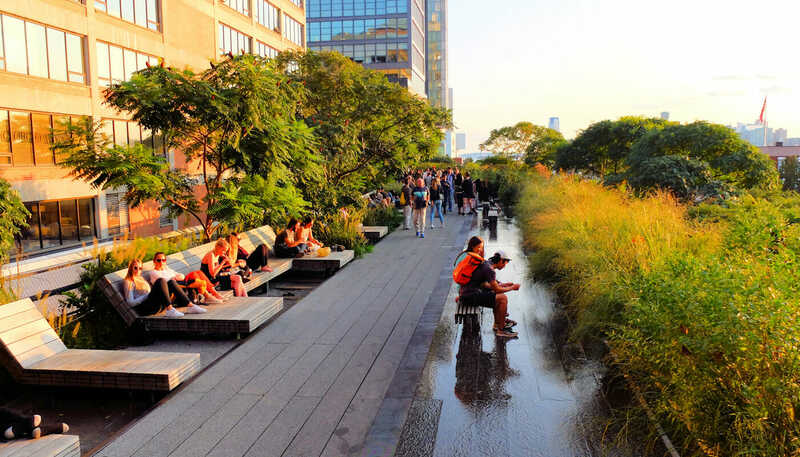 This park built on an old, elevated railroad offers unusual city views from above, with beautiful plants and artwork all around. You shouldn’t miss this highlight, especially in the summer when everything is in bloom and you can sunbathe or even watch the stars. You’ll see special details everywhere from street level too. 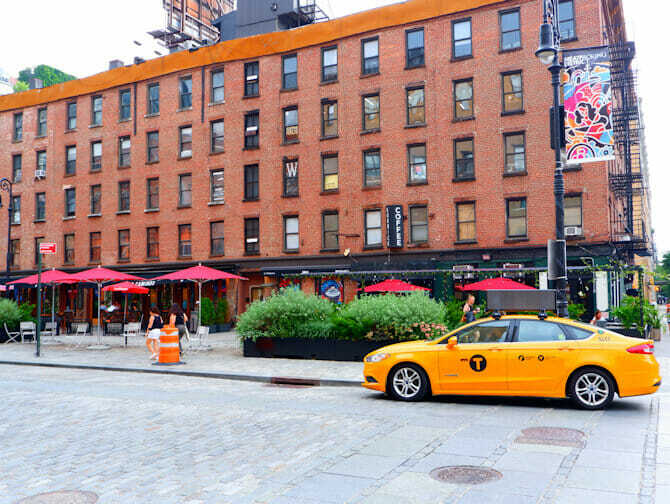 For example Meatpacking District is one of those neighbourhoods, where all alleys are cobblestone streets. 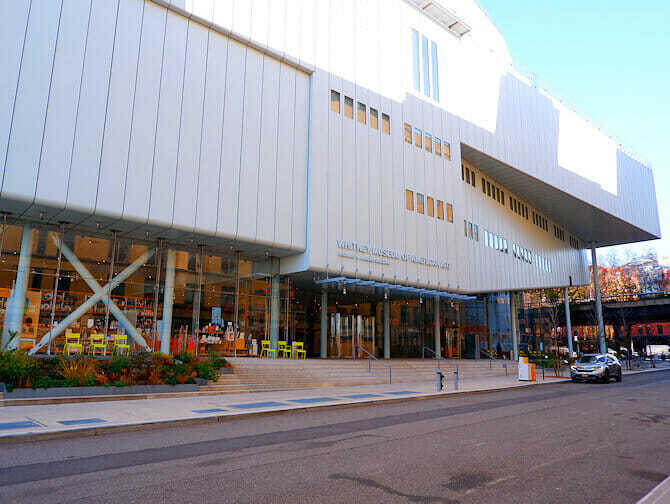 The Whitney Museum reopened in the new Meatpacking location in May 2015 so culture addicts have a good reason to visit. In the beautiful building you will find American art of the twentieth century. There are over 21 000 art works and there is something for everyone: paintings, sculptures, drawings, photos and videos. 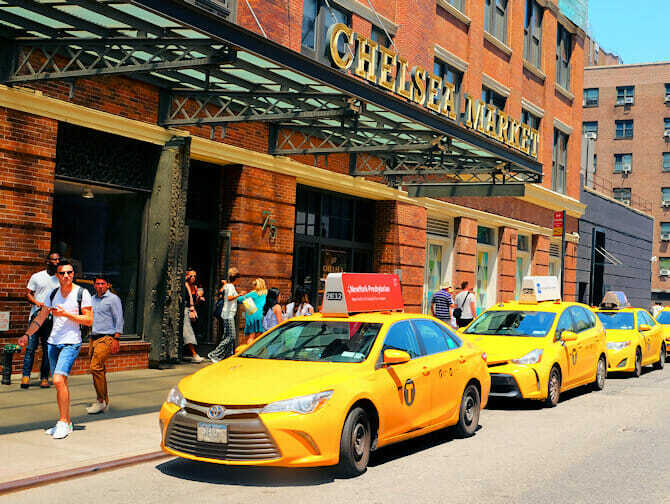 Chelsea Market is so big, it takes up a whole block. This former biscuit factory is filled to the brim with food stalls. It’s even one of the biggest ‘food markets’ in the world! Strolling around in the morning gathering goodies for breakfast is good fun. 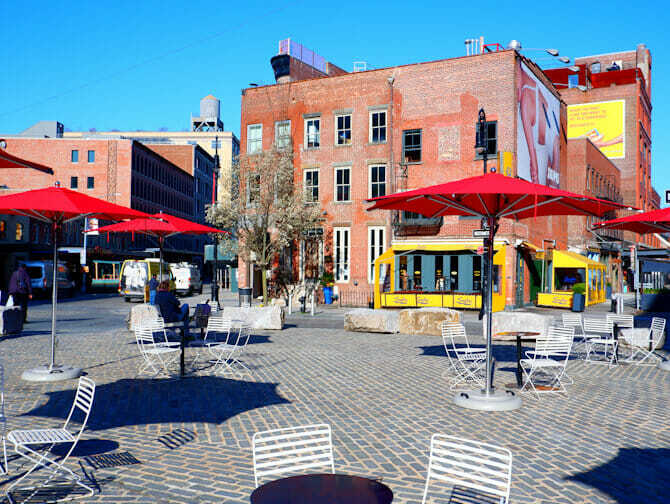 You can also compose a picnic basket and eat the delicacies in the 14th Street Park – the part of Hudson River Park located in Meatpacking District. STK steakhouse in Meatpacking District is their flagship location with a very luxurious and brilliant atmosphere. Steak lovers will enjoy themselves here: a small steak costs $25, but you can also choose one of $99. Personally, I always choose the ‘filet’, a steak with little fat (you can order it either small or medium size). The ‘Little Big Mac’ is a good choice for a starter. You’ll get two small hamburgers (called ‘sliders’) for $20. The extra advantage is that they’re easy to share and above all I think they’re one of the best (small) burgers in New York. Bottles of wine start at $45 and booking a table in advance is a must!